Signoria has added new collections for 2006 and DefiningElegance.com is proud to announce the addition of Poltrona to our site. The timeless style of Poltrona by Signoria in a beautiful jacquard is silky to the touch. This collection consists of 580 thread count Egyptian cotton in tranquil tones of neutral Luce and Mastic. Detailed with hemstitching, the flat sheets and pillowcases are solid sateen in the same Luce color with a Mastic border. For maximum impact and contrast, the stipple quilted coverlet and shams are available in the Mastic color. Other coordinating pieces can be mixed for your own personal touch. Please visit https://www.definingelegance.com/poltrona.html for more details . Before lavishing your bed with luxury linens, start with high quality basics. SDH Enterprises, a textile company based purely on all natural luxury fabrics, takes their commitment to providing comfort and quality all the way down to the core. 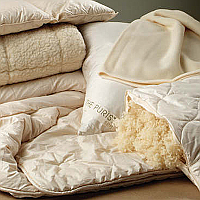 You’ll find their comforters in down and wool to have luxuriously plush qualities like none other. Please visit https://www.definingelegance.com/fundamentals.html for more details of Purists Fundamentals comforters and pillows.